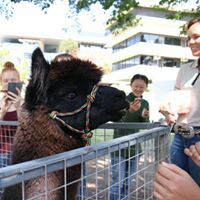 The Natural Amphitheatre at The University of Queensland played host to one of nature’s most gentle creatures, the alpaca. On the 13th of September HASS Crew from the Humanities And Social Sciences (HASS) faculty threw the HASS International Picnic. The event featured a variety of international foods such as sushi and macarons as well as some Australian staples like fairy bread and a sausage sizzle, but it wasn’t just about the food. The event was designed to bring together students from the faculty and give them the chance to unwind and de-stress while at the same time exposing them to elements of other cultures they may not have experienced before. But the picnic also showed the value of university’s student partners program, as the entire event was spearheaded by HASS Student Partner and Academic Board Candidate, Ian Trinh, with the help of the HASS Student Futures Team. “I strongly believe that there shouldn’t be a disconnect between the university and students, I believe the student partners program, and events like this really help bridge the gap.” Ian Trinh 2018. 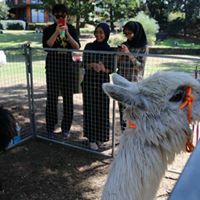 The highlight of the event for most students seemed to be the Alpacas, Star and Knight. Knight originally spelled Night, was a real showman walking around the enclosure collecting carrots from the swam of adoring students. Knight the alpaca. Photo by Shirley Luy, HASS Crew. Star was Knight’s smaller companion and handled the noise and distractions of the strange environment by keeping his head in his food bucket. He might not have actually noticed he was there actually. Star the alpaca. Photo by Shirley Luy, Hass Crew. Overall the event was a success, so much so that the significant amount of attendees got through all the food in less than an hour. In the interest of full disclosure this reporter was briefly considered an alpaca by the operator when allowed into the pen.